Well most Americans have been waiting for 2 years for this night, the longest night of the last two years. When this night is over many Americans will sleep like a baby and others will toss and turn. As I type this report I let out a yawn and I am caught by a fellow video reporter yawning and hoping I will be one of the folks that gets to sleep tonight. You might just see me on nationwide TV yawning, I think they he was with CNN. Anyhow, as I write this I am looking at results that say that Obama is at 199 and Mc Cain 125. Right now we are just sort of piddling around and the energy here at the Frank Lloyd Wright ballroom is one of suspended animation and anytime you can get a Republican to be animated, you have made a step forward. I just got word from my Obama Arizona election office and they say that they close to passing out from the suspense as the numbers rise. Keep your dials tuned here for the latest results here on the ground. Will Roberts is a trick roper and cowboy humorist, who pays tribute to Will Rogers, America’s cowboy, with a wit as quick as his rope. Will is a syndicated political cartoonist and was recently the trick-roping cowboy at Cirque du Soleil. 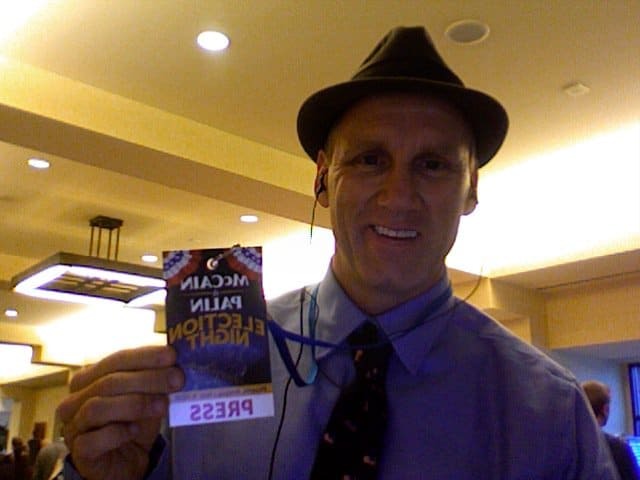 Will has covered the Republican National Convention, Democrat events and the McCain-Obama debates. At home in front of or behind the camera, in front of or behind a radio microphone, Will reports what he sees, usually with a twist of humor.